Directory where the templates are searched. Codec for decoding the files. 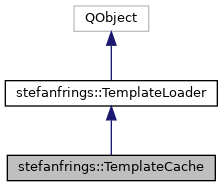 Caching template loader, reduces the amount of I/O and improves performance on remote file systems. The cache has a limited size, it prefers to keep the last recently used files. Optionally, the maximum time of cached entries can be defined to enforce a reload of the template file after a while. In case of local file system, the use of this cache is optionally, since the operating system caches files already. Files are cached as long as possible, when cacheTime=0. Definition at line 44 of file templatecache.h. settings Configuration settings, usually stored in an INI file. Must not be 0. Settings are read from the current group, so the caller must have called settings->beginGroup(). Because the group must not change during runtime, it is recommended to provide a separate QSettings instance that is not used by other parts of the program. The TemplateCache does not take over ownership of the QSettings instance, so the caller should destroy it during shutdown. Definition at line 8 of file templatecache.cpp. Try to get a file from cache or filesystem. Definition at line 16 of file templatecache.cpp.